I teach a Canadian history survey course that is designed for first-year students. The course is designed to teach them about both Canada’s past before 1867 and about the study of history at the university level. Normally, there are two lectures per week. This week, however, I held tutorials during one of the normal lecture slots. On Monday, I delivered a lecture on the impact of the American Revolution on British North America. Our tutorial on Wednesday looked at the history of slavery in Canada. We discussed slaveholding by First Nations, the enslavement of First Nations individuals by whites, and the smaller number of Black slaves brought into New France and the British colonies. The student will be completing an assignment about a Portuguese-born Black slave named Angélique who was executed for arson in Montreal in 1734. In my fourth-year seminar, our theme this week was economic change in the 1840s and 1850s. We began the seminar by discussing Adam Shortt, “General Economic History, 1841-67” in vol. 5 of Canada and Its Provinces. This reading gave the students a sense of the overall developments of the period. We then moved on to some more modern interpretations of the period. Lawrence H. Officer and Lawrence B. Smith, “The Canadian-American Reciprocity Treaty of 1855 to 1866” The Journal of Economic History 28 (1968): 598-623 and Peter Baskerville, “Americans in Britain’s Backyard: The Railway Era in Upper Canada, 1850-1880” Business History Review 55 (1981): 314-336. We then took our customary coffee break, after which we listened to excellent student presentations on the lives and times of two important individuals, Isaac Buchanan, a Canadian merchant, and Sir Samuel Cunard, the founder of the great steamship line. 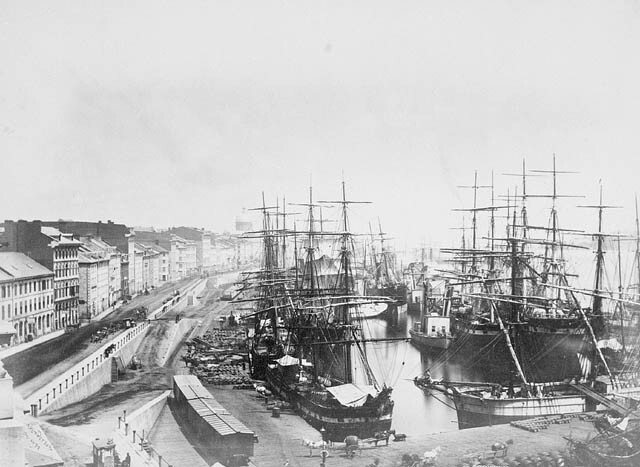 Montreal Wharf, 1874. Note railway boxcars near ship in foreground. Image Source: Library and Archives Canada. Our discussion was wide-ranging and touched on important themes in the history of technology, international trade (hence the picture of a Montreal wharf), and Canadian-American relations. We also talked about how the rich get rich. Do they do it entirely through hard work and their own unassisted efforts? Or do they sometimes use subsidies and other help from the government to grow their firms? Next week’s seminar is entitled “Ideology”. We shall look at how people in an age dominated by classical liberalism justified an increasing number of interventions by government in the economy.